Dalhberg has been working with Blue River Technologies to monitor the growth of dozens of sorghum cultivars. Throughout the growing season, Blue River flew drones over the sorghum nursery with cameras to capture their growth and development. 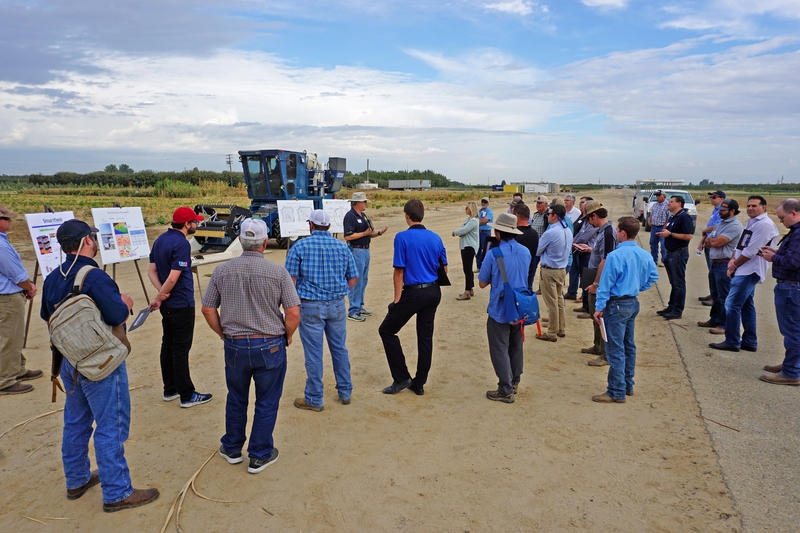 PowWow Energy, based in San Francisco with a field office at the Water, Energy and Technology (WET) Center at Fresno State, met near a well at Kearney to explain how the company can help growers with decision support tools. 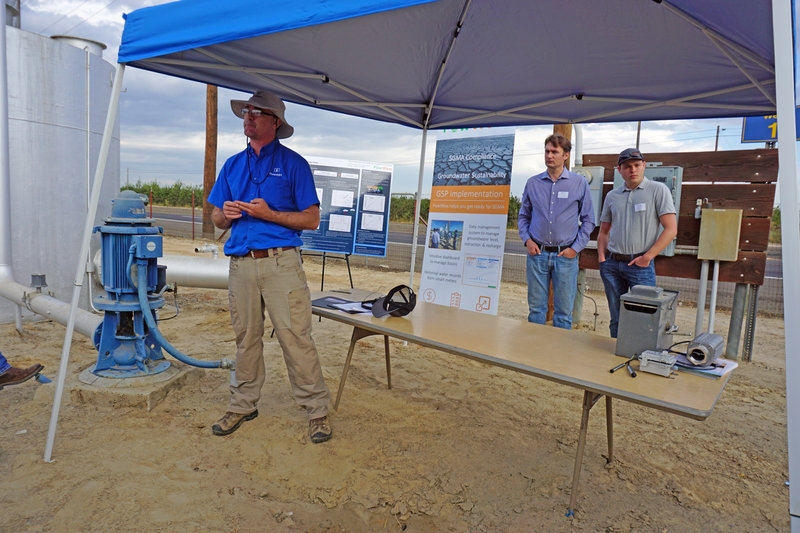 The company believes their technology will be useful for farmers tracking groundwater usage, data that will be key to complying with new rules associated with the Sustainable Groundwater Management Act (SGMA). SGMA, signed by Gov. Brown in 2014, gives local agencies the authority to manage groundwater in a way that achieves sustainability by 2042. Representatives of PowWow Energy meet with Open Farm participants near a well at the UC Kearney Agricultural Research and Extension Center. UCCE agriculture mechanization specialist Ali Pourezza introduced a prototype he developed with junior specialist German Zuniga-Ramirez that he believes will make early detection of the devastating citrus disease huanglongbing as easy as taking a photo with a smartphone camera. The idea is based on the optical characteristics of the disease in leaves. By using a polarizing light, leaves on diseased trees are immediately identified. Infected trees can then be torn out before insects have the chance to spread the disease to other trees. Pourezza and Zuniga-Ramirez are seeking funding to take the prototype to the next level, and eventually commercialize the product. UCCE specialist Ali Pourreza compares a citrus leaf infected with HLB with one that is not infected. This sampling of innovations being showcased at Kearney is part of a continuing effort by UC to connect the ag community with technology developers and resources that is shepherded by a new UC ANR program called The VINE, Verde Innovation Network For Entrepreneurship. The VINE was created by UC ANR in 2017 to link entrepreneurs with mentors, advisors, collaborators, events, competitions and education. At Open Farm 2018, UC ANR vice president Glenda Humiston was the keynote speaker. She outlined three areas where farmers, the technology sector and academia can work together to accelerate technology application in rural parts of California: improve broadband access, identify high-value uses for biomass and establish water infrastructure in rural communities. To address the broadband issue, Humiston is leading an initiative to document mobile internet speed across California – including rural areas. In April 2019, Humiston plans to enlist 4-H members across the state to test internet speed using the free smartphone app CalSpeed several times over a period of a week. “This will give us a snapshot of mobile broadband service availability,” Humiston said. The crisis in the Sierra Nevada – where millions of trees died from the drought of 2010-16 – could prompt the development of high-value uses of biomass and establish a market for biomass derived in the agricultural sector, she said. Humiston also took the opportunity to ask participants to help make sure the critical services UC ANR provides – including county-based UC Cooperative Extension, nine research and extension centers, the UC integrated pest management program, 4-H youth development, UC Master Gardeners and others – continue to fuel the California economy. Diminished funding from the State of California is taking a toll on the UC ANR budget. “We need people like you to work with the VINE to set up improved support,” Humiston said.